It's 2:05 in the morning and I really should be asleep. Indeed, I just blinked my eyes to refocus them, and stood up to go over and blow out a candle... and then just as suddenly sat back down, realizing I couldn't blow it out. Not yet. Because, for the second time this year (and really, once was more than enough, thank you very much), I found myself lighting a candle in memory of a teenager who had touched my life, another soul lost to suicide. I will respect the privacy of the family and spare you all the details. But I think of the people in his life, forever separated from his physical presence and forever deprived of his emotional presence, no matter how firmly his memory is embedded in their hearts and minds. His parents. His girlfriend. His friends. Other family members. "X finished his life on Earth and left the stage in a manner that leaves those of us left behind with a cry of agony in our hearts, as the fragile thread of our faith is dealt with so violently... For something in you dies when you bear the unbearable, and it is only in that dark night of the soul that you are prepared to see as God sees, and to love as God loves... Now X's soul is free, and the love that you can share with him is invulnerable to the winds of changing time and space. In that deep love, include me." We all have our own inner demons, and we all struggle with them as best we can. For some, the struggle is harder than for others. For some, more than we feel we can bear. But we need not bear that struggle alone. In reaching out to others, we find strength. And as I hear again and again and again the words of my advisees last December, raging out against the veil of silence so often placed over suicides so that the deaths become all but invisible, I find myself renewing my vow to do what I can to illuminate the facts of teen suicide, of suicide in general. Only by talking about tragedy can we hope to prevent more tragedies. We may raise awareness in potential victims of what they are going through, how to cope - and the hole they would leave behind - and incite them instead to reach out for help. We may raise awareness in friends and family of how to identify potential victims, recognizing they aren't responsible for the decision but nonetheless helping them to know when to intervene before it is too late. We may think of the critical role teachers, coaches, and other significant adults in kids' lives can play in raising that awareness, in reaching out to kids, in helping strengthen them - in doing something, anything, to prevent more nights like tonight. 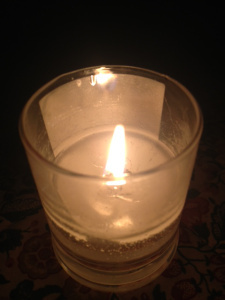 It is now 2:41 in the morning and there remains the problem of the candle, flickering on a nearby table. Nothing, including the candle, lasts forever. But everything, including the candle, should live out its natural life. At least for now, then, I will let it continue to burn. And when its image is seared permanently into my brain as a symbol of my ongoing commitment to action, its flame, too, will have become invulnerable to the winds of changing time. Then and only then will I blow it out. And hope I never ever light it again.